New England Patriots owner Robert Kraft has denied any wrongdoing by his team as NFL's 'deflate-gate' rumbles on. The Super Bowl finalists are under investigation after being found to have used under-inflated balls in their 45-7 victory over the Indianapolis Colts. Kraft believes "unconditionally" that the Patriots have "done nothing inappropriate" or violated NFL rules. He also wants the NFL to apologise if his side, who face the Seattle Seahawks in Sunday's Super Bowl, are cleared. 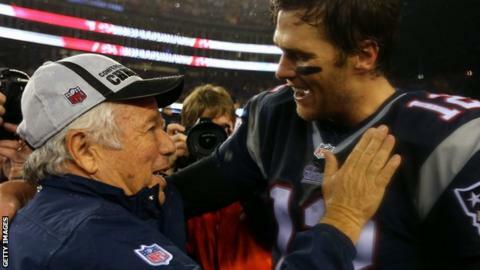 Kraft went on to defend Patriots coach Bill Belichick and quarterback Tom Brady, the two men at the centre of the saga. "I am disappointed in how this entire matter has been handled and reported upon," said Kraft. "I would expect and hope that the league would apologise to our entire team and in particular Bill Belichick and Tom Brady for what they have had to endure this past week." Each side uses it own set of balls during a game, but the NFL says there is evidence Patriots used 11 under-inflated balls in their AFC Championship win over the Colts. Deflating the balls in cold or wet conditions provides more grip. Belichick says his attention is on the Super Bowl and "that is where it is going to stay for this week"
Belichick has already insisted his team have followed "every rule to the letter", while Brady has also said he is innocent. "Tom, Bill and I have been together for 15 years, they are my guys, they are part of my family." added Kraft. "I have never known them to lie to me. "It bothers me greatly that their reputations and integrity - and by association that of our team - has been called into question." Following New England's arrival in Phoenix for Sunday's contest, Belichick declined to discuss 'deflate-gate', saying his focus was on the game. However, Brady chose to speak and said his feelings had been "hurt" by claims of wrongdoing. "I personalised a lot of things and thought this was all about me," he said. "My feelings got hurt. Then I moved past it, because it's not serving me. "What's serving me is try to prepare for the game ahead. I'll deal with whatever happens later." According to Fox Sports, a Patriots locker room attendant is the latest person under suspicion after he was seen taking the match balls into a bathroom before kick-off. Meanwhile, Ted Wells, the investigator hired by the NFL, said he expects his investigation to last at least several more weeks.